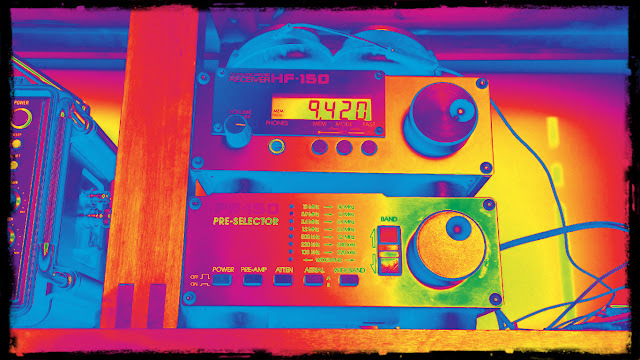 In this post I upload a few interesting shortwave clips from my archives, made using my indoor recording set-up. A Romanian folk song recorded from Antena Satelor's long wave transmission. An interesting fusion of western classical music with Arabic vocals recorded from Morocco's Medi1. A song by Wadih El Safi recorded from Radio Damascus's medium wave transmission. A qawwali by Nusrat Fateh Ali Khan recorded from All India Radio. A slow, dreamy song recorded from The Voice of Turkey. Why use the tablet instead of a laptop? Small size: At 8", it is much smaller than almost any laptop available on the market. Price: at $169, it's cheap enough to be the dedicated device for this project. I suspect that many tablets under $100 — such as the HP Stream 7 — are in the same performance league as my two year old Toshiba, making it an even more attractive choice cost-wise. Battery life: the tablet can capture the spectrum at 3MHz bandwidth for 2.5 hours on a single charge. None of the laptops I own would be able to do the same. USB (5V) charging: this makes it possible to replenish the tablet's battery using a portable power bank, an in-car charger or a foldable solar panel — great for when you want to scan the bands while camping off the grid. Why use AirSpy / SpyVerter instead of another SDR? 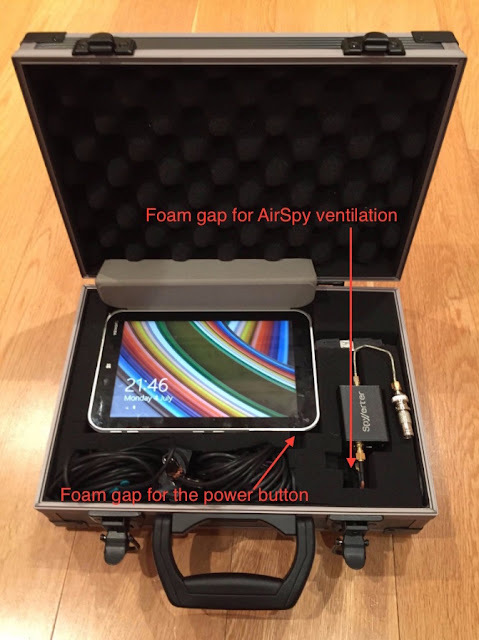 Low power consumption: the AirSpy/SpyVerter combination can run entirely off the USB power supplied by the tablet, requiring no additional power supply units. 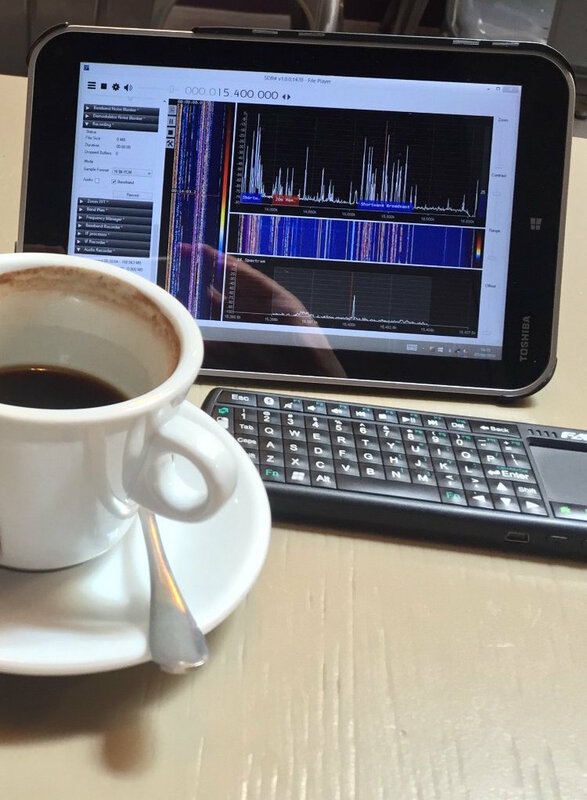 Wideband performance: the two other SDRs I own that can be powered by the tablet alone are the FunCube Dongle Pro+ and SDRPlay RSP1. The FunCube dongle's maximum bandwidth is 192 kHz, while AirSpy is capable of pulling in up to 3MHz without maxing out the tablet's CPU. SDRPlay can provide a similar bandwidth, however, its performance leaves a lot to be desired compared to the other two SDRs. Simply put, the main problem with this radio is the large number of mixing/imaging artefacts at comparable sensitivity (signal to noise ratio) levels and spectrum bandwidth. I demonstrate this in the video below. Bundled software: The other problem with SDRPlay is that the compatible software packages I have tried cannot write large (3MSPS) streams to disk reliably without buffer overruns on my tablet. 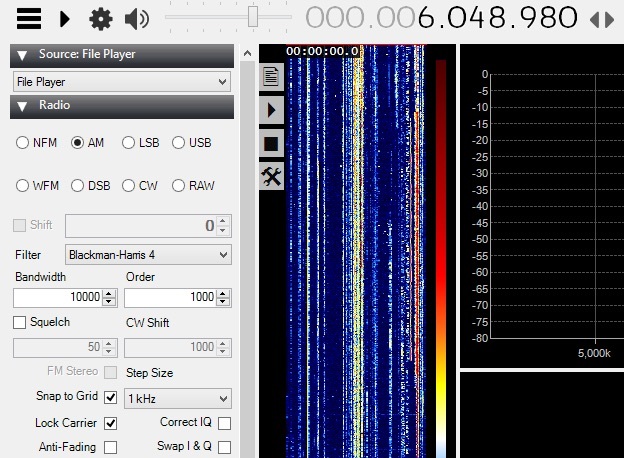 In my evaluations, the Baseband Recorder plugin for SDR# is quite exceptional in this regard, and of course nowadays SDRPlay is not compatible with SDR#. Why use a long wire antenna and not an active magnetic loop or a mini-whip? Power consumption: the long wire dipole requires no additional power, unlike the alternatives. Portability: an active loop antenna would require significant additional space; the same is true for a mini-whip antenna, although to a lesser degree. In this post I continue uploading some of the more interesting things I have recently heard on shortwave using both my outdoor and indoor recording setups. Some of these recordings were made using standalone shortwave radios while the others were extracted from my SDR spectrum captures. A mellow atmospheric tune from Medi1 radio, Morocco. Recorded indoors. Sudanese light pop music from Radio Tamazuj. Recorded outdoors. A song recorded from North Korea's domestic radio service, KCBS Pyongyang. The performer makes the surprising move of copying Whitney Houston's vocal style towards the end of the track, something that would probably have been considered too western and decadent in North Korea only a short while ago. Recorded outdoors. Funky Indian film music from All India Radio, recorded indoors. Traditional Greek music from the Voice of Greece, recorded indoors. I recently purchased a Sony ICF-SW100 after reading multiple glowing reviews of it on eHam and the SWLing post. It's a great little shortwave radio that can easily fit into a jacket pocket. 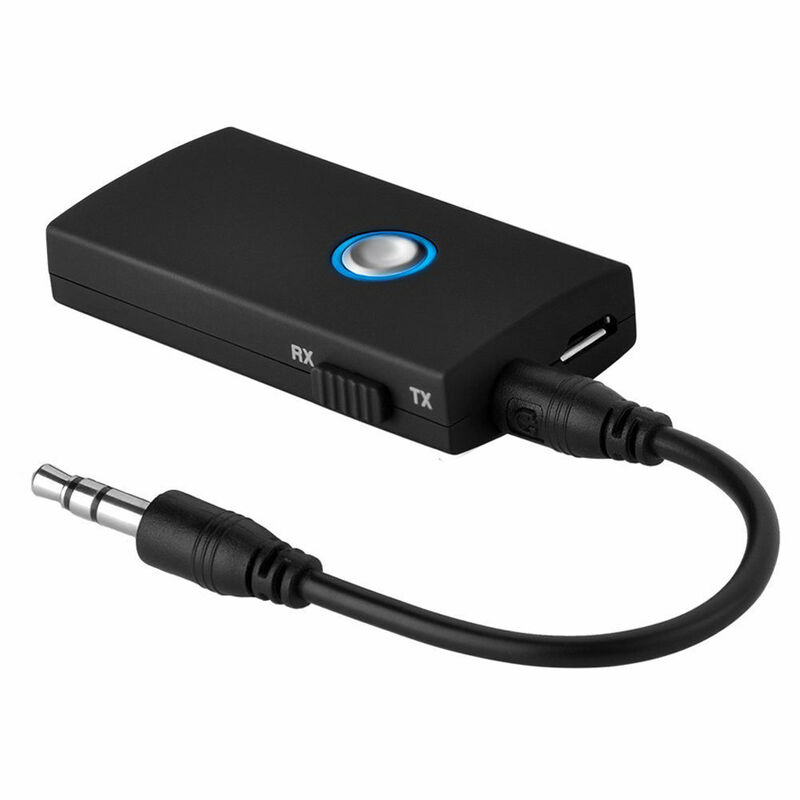 The unit has an external antenna input together with a DX/Local switch that adjusts the radio's sensitivity. However, after using the radio outdoors for several days I have found that the DX setting is just a little too sensitive when using it with the long wire antenna (resulting in distortion on some medium-strength signals), while the Local setting isn't very sensitive at all (meaning that some of these signals can only be heard very faintly). That's the Sony ICF-SW100, a Sony ICD-PX333 recorder, the Maplin variable attenuator with all the cable accessories, an audio volume attenuation cable (for connecting the recorder to the radio's line output), and the long wire antenna. 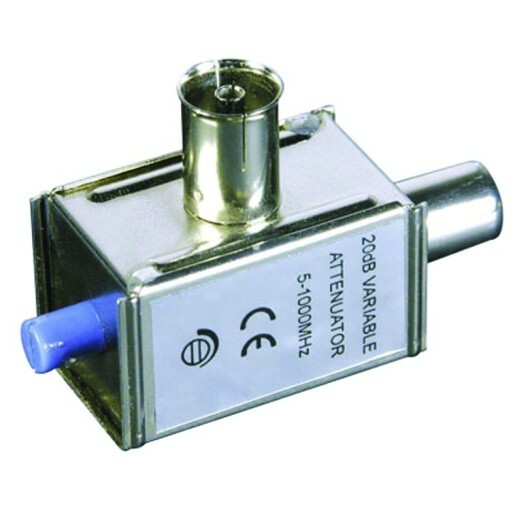 I am quite pleased with ICF-SW100's performance so far, and with this simple and cheap attenuator it's possible to get even more out of this radio in challenging reception conditions. 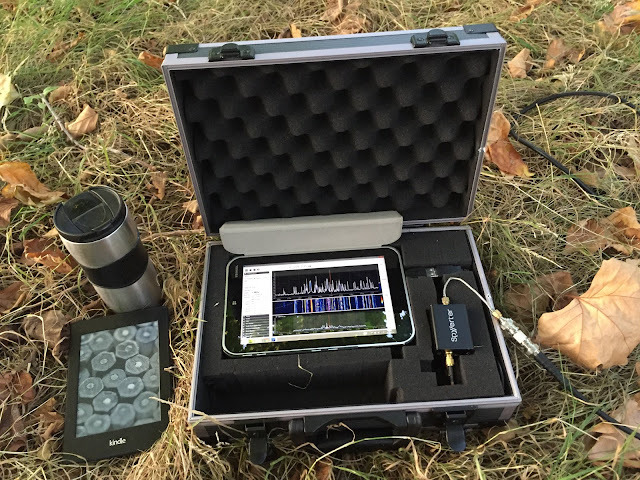 Capturing the shortwave spectrum out in the field. 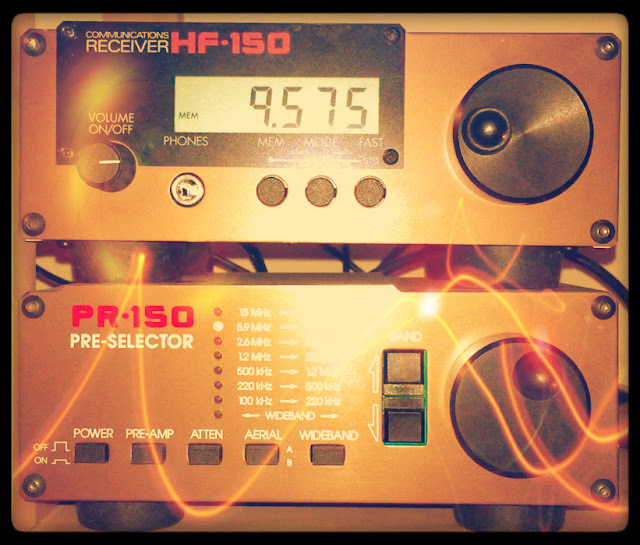 Radio interference is a major problem in big cities when it comes to indoor shortwave reception. One effective solution I have found is to head for the local park and engage in scanning the bands there. However, since my time for making such outdoor trips is limited, I would always feel like I am missing out on a lot of radio action by monitoring a single frequency, which is all you can do with a standard shortwave radio. There are so many signals out there — which one should I go for? 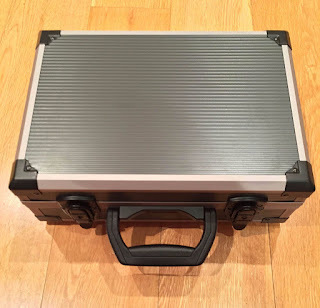 This inspired me to put together a lightweight, portable set-up that would let me capture large chunks of the shortwave radio spectrum out in the field, which I could later explore in detail. After two years of experimenting with various Software Defined Radio (SDR) technologies I am pleased to report that I finally have a solution that works well for this purpose. When I got home from the park, I was able to replay that part of the spectrum capture many times over while scanning the frequency space, which is how I was able to identify a weak signal from a very distant ham radio operator that I might have otherwise missed. 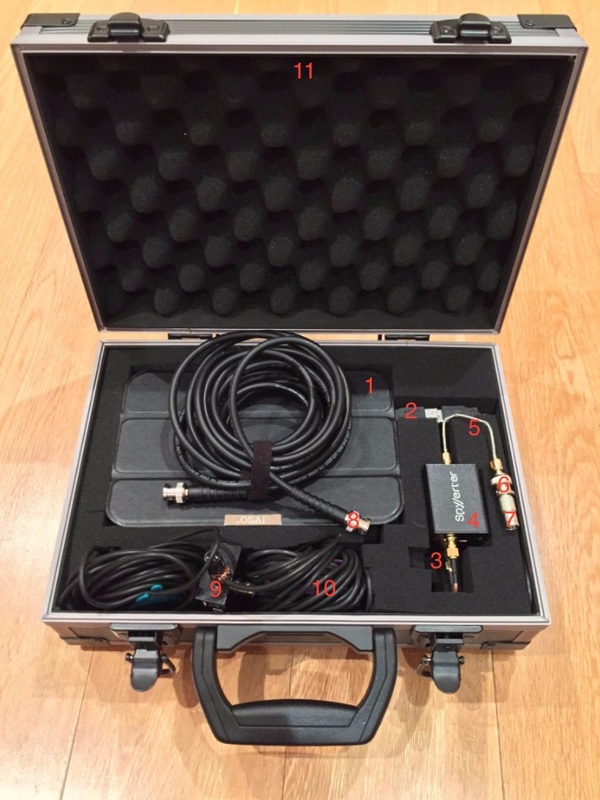 Below is the list of the components I have used to put together my "portable spectrum capture lab". I bought this tablet in July 2014, based on the following criteria: the device had to have a reasonably powerful Intel processor, running the Windows 8 operating system. I believe that there are currently models on the market that are at least as powerful and are substantially cheaper (<$100). 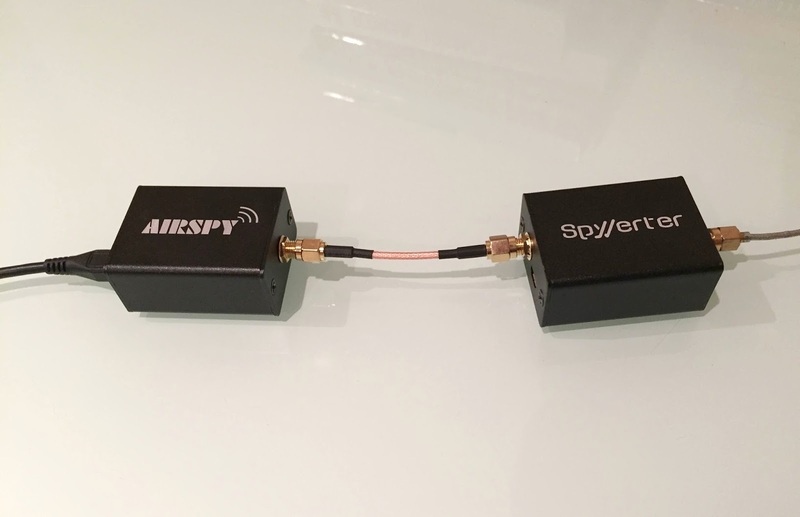 Owing to its unique hardware design, the AirSpy SDR can monitor large parts of the radio spectrum (up to 10 MHz in bandwidth) while offering a high dynamic range and robustness to overloading, with almost no mixing/imaging products. 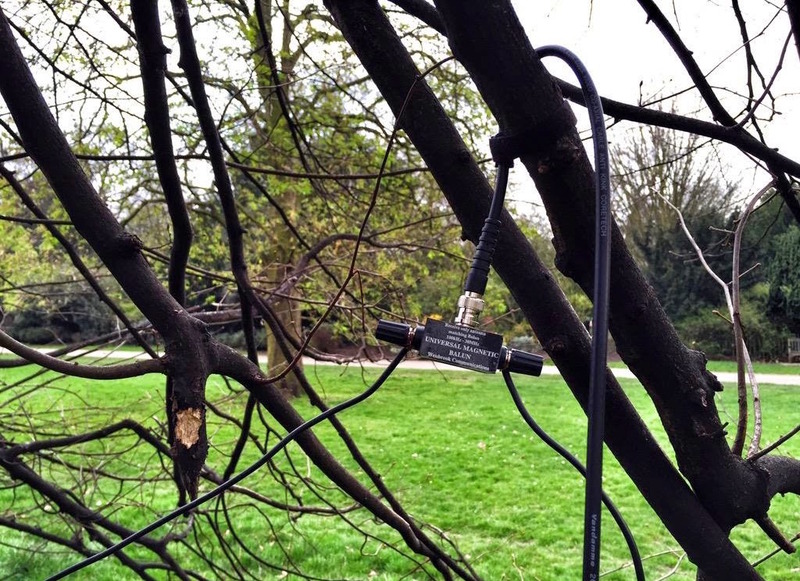 I use a three-terminal matched balun connected two 6 metre copper wires via its antenna terminals as a dipole antenna, and connect it to the SDR via the feed line terminal with the 3m BNC cable listed above. The balun (Wellbrook UMB130) is engineered in a way that prevents the radio noise current from the tablet (usually a significant source of interference) flowing into the receiving part of the antenna. 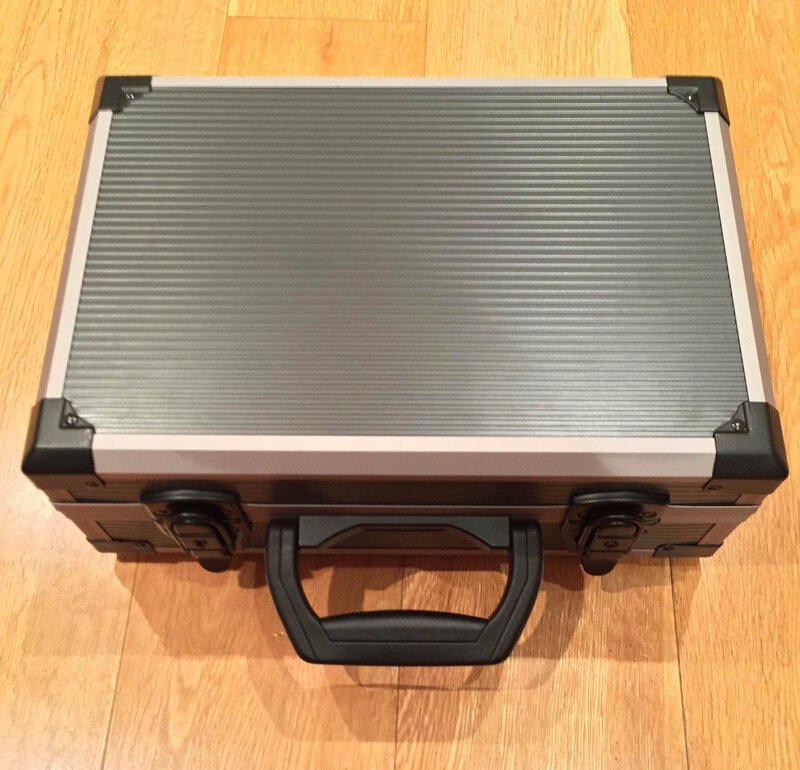 This foam-filled flight case comfortably houses all of the components. The parts 1 to 7 can remain assembled together, reducing the deployment time in the field. I use this fast microSD card as the destination for my outdoor SDR recordings. 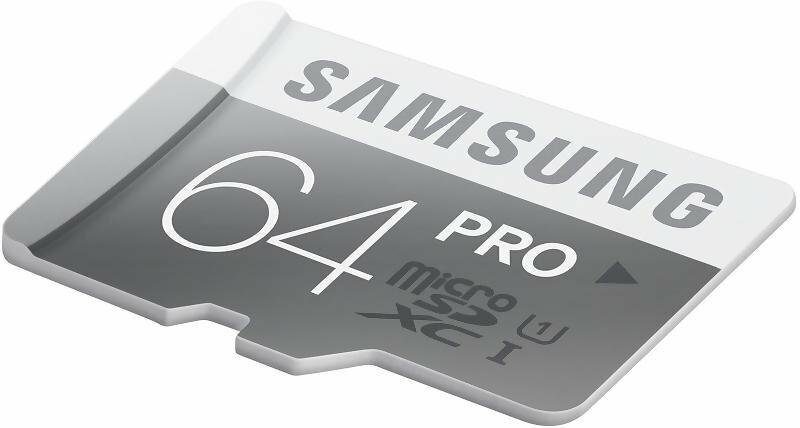 The high transfer speed is critical - using slower microSD cards will result in large portions of the spectrum being dropped from the recordings. 64 Gigabytes can accommodate roughly one hour of spectrum data at 3 MHz bandwidth. Windows tablets suffer from one major drawback: the touchscreen interface is usually inadequate for software that was designed for traditional computers with mice. 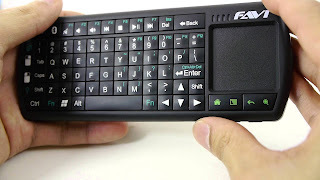 A portable Bluetooth keyboard with a built-in trackpad solves this problem. This small gadget turned out to be a very important part of the entire project. The Toshiba tablet has a rather unusual interference quirk that initially caused me hours of frustration. It turns out that significant amounts of radio noise are injected into the SDR when the tablet's external speakers are active. One way to fix this is to plug a pair of headphones into the tablet's line out jack, but this forces the listener to be glued to the device. The alternative is to pair the tablet with a Bluetooth audio receiving unit, such as the one listed above. It is worth noting that my other Windows tablet — a Dell Venue 8 — also suffers from this strange artefact. You'll see that I have stacked the SpyVerter enclosure on top of the AirSpy one. As the latter can get very hot, it is essential to leave a sufficiently large gap in the foam for ventilation. It's also worth leaving a small gap next to the tablet's power button to prevent Windows from accidentally going into standby mode. Baseband Recorder: this plugin enables efficient recording of very large spectrum (or "baseband") files. Download and decompress the plugin zip file. Copy the .dll files into the directory with the SDRSharp.exe executable. Open the MagicLine.txt file and copy the first line of text into Plugins.xml file, just before the "</sharpPlugins>" line. File Player: this plugin enables the playback of recordings made with the Baseband Recorder plugin. Download and decompress the plugin zip file. Copy the .dll files into the directory with the SDRSharp.exe executable. Open the MagicLine.txt file and copy the first line of text into FrontEnds.xml file, just before the "</frontendPlugins>" line. Open SDRSharp.exe and check that the program reports no errors when it loads. In the plugin pane on the left, expand the Baseband Recorder tab and click "Configure". Change the File Format to WAV RF64 and make sure that the File length limit check box is not ticked. Click "Folder select" and choose the MicroSD card as the destination directory for the recordings. Disclaimer: in this section I describe how I capture the maximum spectrum bandwidth that my tablet's CPU can handle. It involves operating SDR# in "debug mode" and exposes some internal functionality of AirSpy, which, if used incorrectly, can damage the radio. If you choose to copy my approach, please understand that you are doing so at your own risk and follow my instructions carefully to avoid voiding your AirSpy warranty. Open SDRSharp.exe.Config file in Notepad. Look for "<add key="airspy.debug" value="0" />" line and change it to value="1". Once the AirSpy and SpyVerter have been connected to the tablet, open SDR# and select AIRSPY in the Source tab. You will see the following configuration dialog. In the "Sample rate" field, type in "6 MSPS". For the "Decimation" option, choose "2". This setting will result in spectrum captures of 3 MHz bandwidth (although only 2.4 MHz of it will be shown on the waterfall display). To capture smaller chunks of the spectrum, increase the decimation value. Make sure the SpyVerter check box is ticked. Do not touch any of the fields or buttons under the "Address Value" line. Press the play button in the top left corner and set the desired frequency. In the Source tab, select the "Linearity" option. Keep increasing the Gain value by one position at a time until you notice that the radio signals suddenly become "saturated" (the waterfall display becomes full of artefacts and the signal you are listening to gets swamped with noise). Take the Gain value back down by two positions. This will ensure high sensitivity while preventing AirSpy from overloading. In the Baseband Recorder tab, press "Record". While recording, do not change the radio frequency and do not move/drag the waterfall portion of the display. Stop the recording after a few minutes. In the Source tab, change the input to "File Player" in the drop down menu. Click the Settings cogwheel button and select the spectrum recording file from the MicroSD card. A vertical band visualising the timeline of the spectrum capture will appear immediately to the right of the plugin pane. 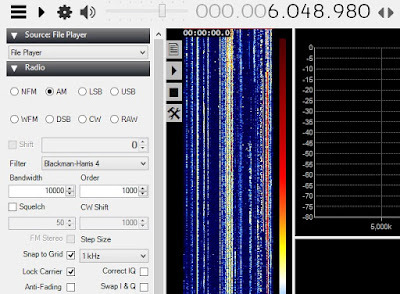 Click on the play button and select a radio signal to demodulate in the spectrum display. Listen to the audio carefully to make sure there are no dropouts or clicks: if so, your tablet and MicroSD card are capable of handing and storing the specified spectrum bandwidth. While making longer spectrum recordings, select a weak radio signal and keep monitoring its audio for signs of overloading. If the overloading does occur, reduce the Gain value further by one or two positions. Shortwave for lunch. Playing back parts of the shortwave spectrum captured earlier in the park, inside a local cafe. 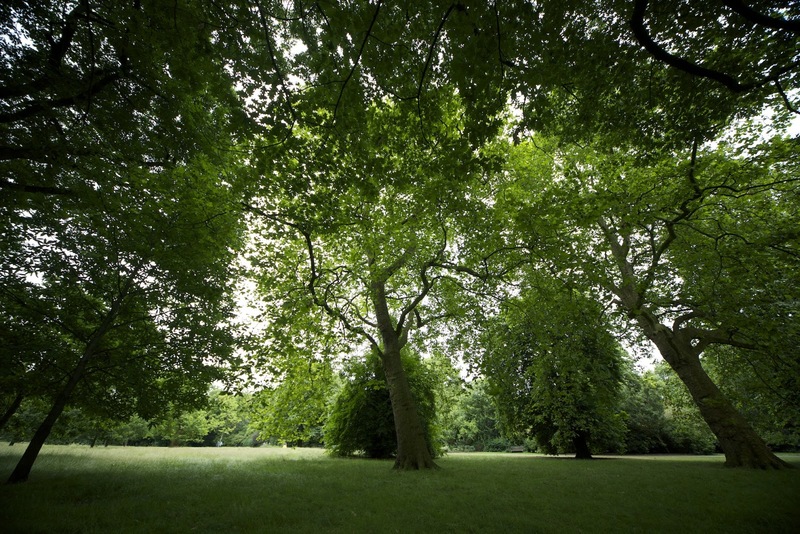 Below are some example videos in which I play back and explore the spectrum recordings I made during the trips to my local park. Tropical and the 49m bands recorded outdoors on 03/07/16 at 0432 UTC. 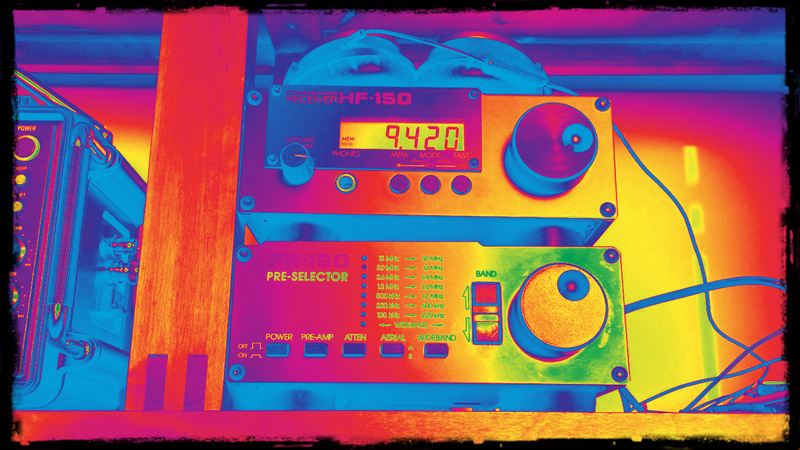 A good time of the day for listening to Latin America on shortwave. Listening to Radio New Zealand International. Radio Aparecida from Brazil, usually a challenging catch in Europe. Drop me a line in the comments section or hit me up at @LondonShortwave. Also, be sure to check out the portable spectrum capture Q&A post I wrote in response to some of the questions I received.